Natasha: You understand why this place has to be obliterated? Clint: What about Krylenko’s wife and kid? Don’t they deserve to know why he died? Natasha: Who do you think told Russian intelligence where he was hiding? Clint killing Bruce Banner in Civil War II #3 was almost the natural endpoint of several years of Brian Michael Bendis Clint stories, where he was killed, resurrected, and then forced to cosplay a ninja, all of which seemed to lead to his contemplating murder. 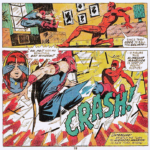 Outside of these Bendis plotlines, though, Clint has always been queasy about killing. 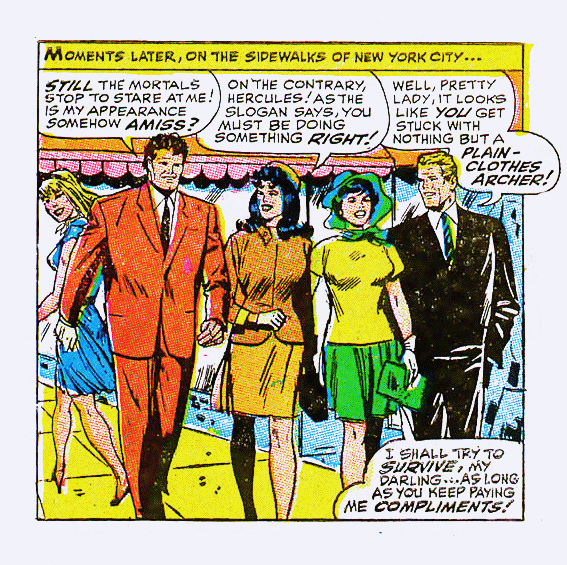 In this story, Clint investigates a murder that leads him to Natasha. It turns out that his local deli owner was actually a genocidal war criminal who still had control of illegal sarin gas weapons. 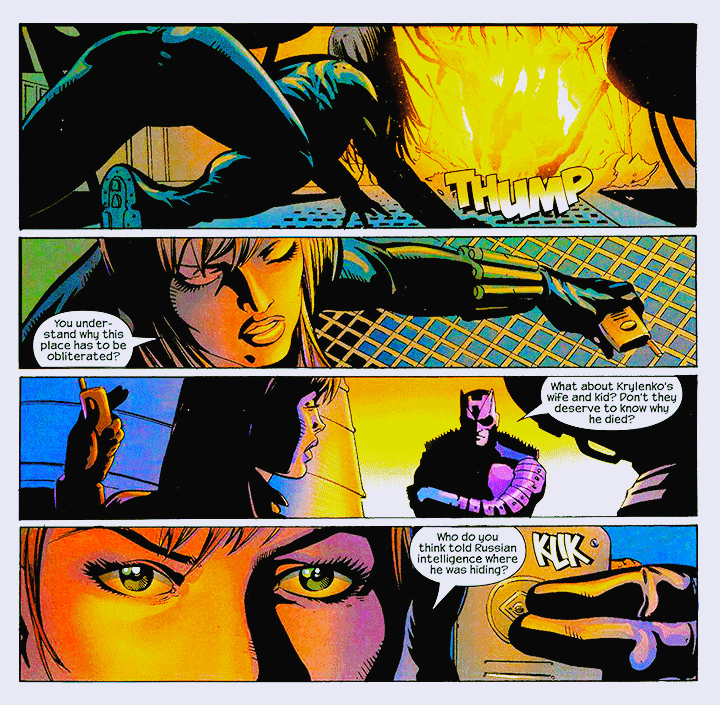 Natasha was hired by the Russian government to kill him in order to prevent another genocide— which was too morally complicated for Clint’s comfort. The situation doesn’t quite repeat in Civil War II #3, but it rhymes: the idea of killing as preemtive self-defense not quite being murder, and the twist of the victims themselves being complicit. 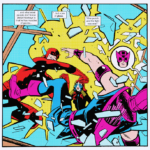 Clint was predictably Not Okay with Natasha’s actions here, which makes it interesting to think how Natasha would react to Clint’s current predicament. I don’t think she’d relish the role reversal. 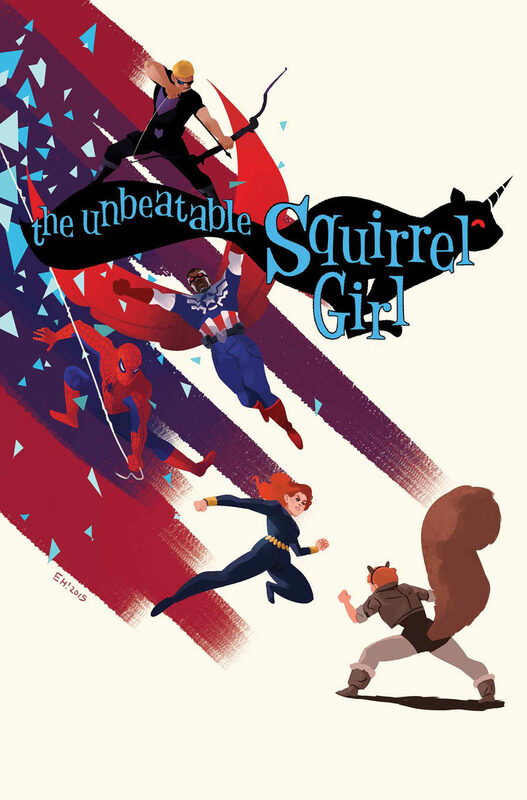 Part of the reason Natasha keeps doing dubious things for the Avengers is so other people do not have to. At the end of her last series she had actually determined not to do that anymore, to stop taking on every moral cost. 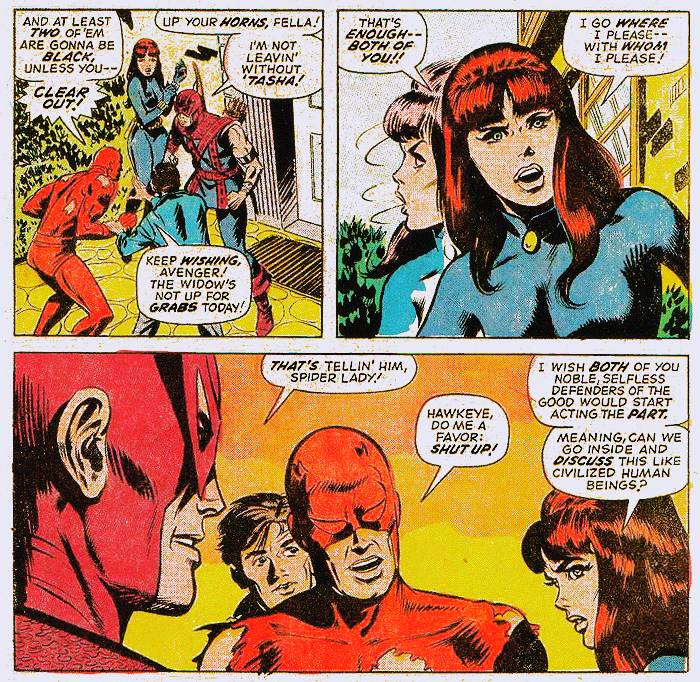 Perhaps she would see Clint’s change as an inevitable result of that decision, instead of many years of Bendis plotlines. 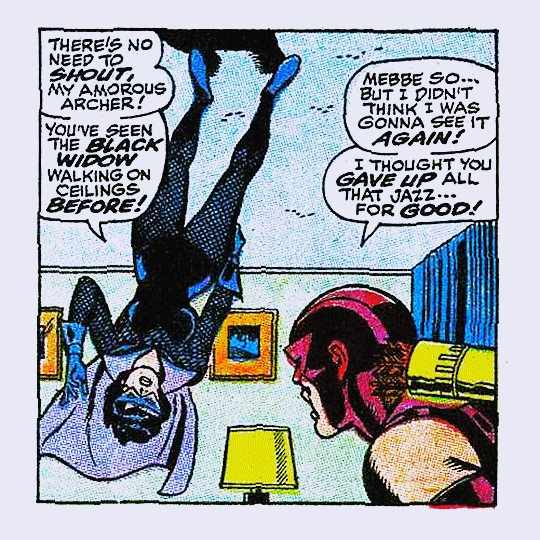 It wouldn’t be logical but Natasha has a lot of guilt where Clint is concerned already. I doubt we’ll see this actually touched on anywhere, but the Mockingbird book is dealing with similar issues from Bobbi’s perspective, since their relationship has also suffered lots of obstacles related to when to kill and when to let things die. Basically, everyone should be reading Mockingbird. From Hawkeye #8 , by Fabian Nicieza and Joe Bennett. 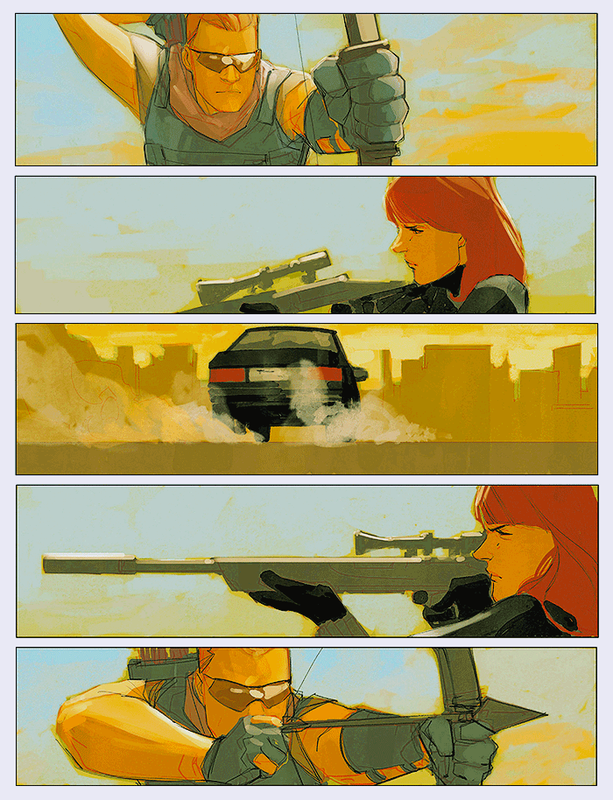 From Black Widow #10 , by Nathan Edmondson and Phil Noto. Natasha: Look at the state of you. Who was your date last night? Did she bring a threshing machine with her? 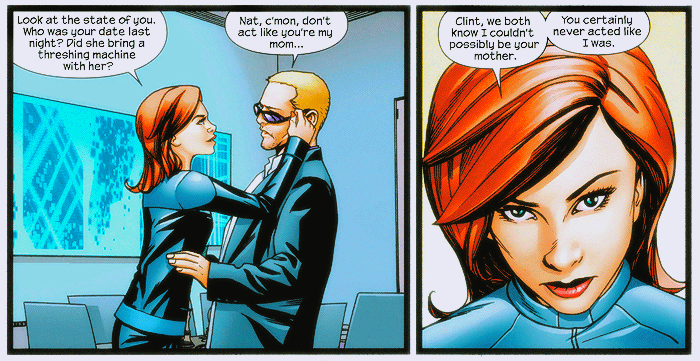 Natasha: Clint, we both know I couldn’t possibly be your mother. You certainly never acted like I was. 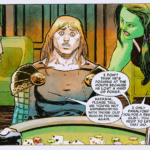 From Avengers: Endless Wartime by Warren Ellis and Mike McKone.